Boy band member and actor Cha Eun-woo shed insight on the often overlooked trouble of being born beautiful. Cha seems to fit the archetype of a pretty boy band member, as he often makes headlines and attracts roles that highlight his appearance. He is the only one that managed to leap mainstream out of the six members of Astro, with which he debuted in 2016 under midsized talent agency Fantagio. 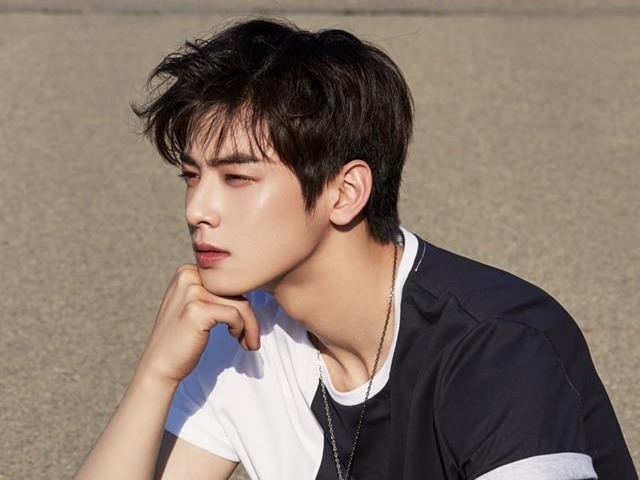 The 21-year-old’s latest role in the hit TV series “Gangnam Beauty,” which helped him rise to prominence on the small screen, was also largely built around his looks. In October, Cha was cast to play the lead role in YouTube’s original series “Top Management.” His new role doesn’t fall too far from his previous role of the have-it-all male lead -- dreamy, popular and smart. Good looks are also an important aspect of Yeon-woo, the character played by Cha in the 16-episode series that premiered on Oct. 31 on YouTube channel 1theK. “It’s not easy to nail the role of Yeon-woo, a born star. It is a character only Cha Eun-woo can pull off,” the series’ production team said of the casting decision. The soundtrack of the series released Thursday includes a song written and sung by Cha, with the lyrics echoing the singer-actor’s unique predicament of talent being overshadowed by beauty. “I sing quite nicely. I can also cook pretty well. I’ve got brains, too. But all that anybody ever sees is my face,” sings Cha. Being pretty has its costs.